These guidelines were originally adopted for use on September 16, 1998 by the Morris Solid Waste Advisory Council. Slight changes to the approval timeline and grammatical improvements were made to these guidelines during the drafting of the March 2007 Plan Amendment. The following guidelines will be used by the Morris County Solid Waste Advisory Council (SWAC) in evaluating requests to amend the Morris County Solid Waste Management Plan (Plan) for inclusion of solid waste facilities. Plan inclusion is required for all solid waste facilities prior to operation and NJDEP permitting/approval. Facility Plan Inclusion Process: Describes the process an applicant goes through with respect to amending the Solid Waste Management Plan. Details are included on the SWAC evaluation process as well as a description of the overall process relating to the evaluation from other related agencies. These agencies include, but are not limited to, the Morris County Board of Chosen Freeholders (Freeholders), the Morris County Municipal Utilities Authority (MCMUA), the host municipality and the New Jersey Department of Environment Protection (NJDEP) and others. Evaluation Criteria: This lists the basis that the SWAC uses while formulating its recommendation to the freeholders. Submission Information: This section provides details on the information to be supplied by the applicant. Ongoing Responsibilities: Once operating, the facility will have responsibilities to ensure continued compliance with laws, regulations and the Solid Waste Management Plan. This section describes these requirements. The SWAC reserves the right to request additional information, if needed, for a proper review of an applicant’s Plan inclusion request. A proposed facility requires inclusion in the Solid Waste Management Plan and needs to obtain approval and/or permits from the NJDEP prior to operation. The process to receive the necessary Solid Waste Management Plan inclusion is provided below. The SWAC initially reviews Plan inclusion requests and provides recommendations regarding the proposed facility and proposed amendments to the Plan to the freeholders. The SWAC review process will begin at the time the application is formally provided to the SWAC. The SWAC’s role with respect to the freeholders is advisory and non-binding. A SWAC subcommittee will formulate a recommendation based upon the review of a proposal and provide the recommendation to the entire SWAC at one of its public meetings. Upon notification that the application is complete and is being scheduled for consideration by the SWAC at a public meeting, the applicant shall publish a legal notice. This notice shall be published two times in a newspaper having general circulation within Morris County, once each week for two (2) consecutive weeks, notifying the public of the application to amend the Solid Waste Management Plan and the scheduled public meeting. The second notice shall be published at least seven (7) days prior to the scheduled public meeting. Prior to the SWAC public meeting, the applicant must provide proof of publication to the SWAC. The legal notice shall state the date, time and location of the SWAC public meeting; the nature of facility; the address (including block & lot numbers) of the proposed site; the location of depositories where the application can be inspected by the public; and that written comments on the proposed facility will be accepted by The Solid Waste Advisory Council, c/o Morris County Municipal Utilities Authority, P.O. Box 370, Mendham, New Jersey 07945-0370. The applicant shall mail a copy of the published legal notice to the municipal clerk of the host municipality at least 10 days prior to the SWAC meeting and provide proof of such to the SWAC. The SWAC provides a non-binding, advisory recommendation to the freeholders in the form of a resolution adopted during a public meeting. Subsequent to the SWAC recommendation, the freeholders will schedule a public hearing to consider the proposed facility and Plan amendment. After adoption by the freeholders, the Plan amendment is sent to the NJDEP for its approval. The freeholders shall adopt their resolution regarding such an application no more than 120 days after the applicant is notified that the application is complete. The applicant shall submit a copy of the application to the Board of Chosen Freeholders. 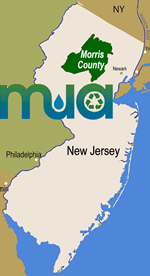 The MCMUA has been designated by the freeholders in a Plan amendment to be the implementation agency of the Solid Waste Management Plan. As such, the MCMUA provides a recommendation on the proposed facility and Plan amendment to the freeholders. The applicant shall submit a copy of the application to the Morris County Municipal Utilities Authority. The NJDEP provides the facility with either a permit and/or general approval to operate. The NJDEP will not review permit and/or general approval applications without the facility first being included in the district’s Solid Waste Management Plan by way of an NJDEP Commissioner certified “as approved” Plan amendment. The applicant shall identify any local, state, or federal permits and/or approvals that may be required for the proposed facility. As the permits and/or approvals are applied for, the applicant shall provide the SWAC with full copies of each application. The applicant shall submit a copy of the application to the governing body of the host municipality at the time it submits its application to the SWAC indicating the host municipality shall maintain a copy of the complete application and supporting documents in the host municipal building. For information purposes, the applicant shall send a copy of the application to the municipal clerk of any municipality within 200 feet of the site boundary. The applicant shall formally request in writing that the governing body of the host community adopt a resolution setting forth its position relative to the inclusion of the proposed facility in the Solid Waste Management Plan based on the application provided to the SWAC and the host municipality. If there is no resolution adopted by the host municipal governing body within three (3) months of the applicant’s request, then the SWAC may consider the inclusion of the facility in the Morris County Solid Waste Management Plan without a resolution from the host municipality. In the applicant’s written request to the host municipality it shall be indicated that the SWAC is allowing three (3) months for the municipality to provide its position in the form of a resolution. The SWAC will also inform the municipal clerk in writing for distribution to elected officials of its receipt of a Plan inclusion application and its intention to review the application which may result in a recommendation to the freeholders. This letter will also request that the governing body adopt a resolution setting forth its position on the proposed facility within three (3) months of the receipt of the SWAC letter and that the resolution be forwarded to the SWAC and the freeholders. Anything to the contrary and not withstanding, the SWAC will begin its review process upon receipt of the application. The applicant shall mail of a copy of the published legal notice advertising the public meeting at which the application will be considered by the SWAC to the municipal clerk of the host municipality at least ten (10) days prior meeting. The applicant shall provide proof to the SWAC of all the required mailings to the host municipality, as described above, prior to the SWAC adopting a resolution at its public meeting. The proposed facility will provide for the proper management of solid waste and can be shown to be a complementary component of the coordinated strategy for solid waste management. The proposed facility will not have a negative effect on existing public efforts and legal responsibilities of the County of Morris to manage solid waste management. The facility shall not have a negative effect on public or environmental health, safety or welfare. The applicant has demonstrated the necessary competency, knowledge, resources and experience to operate the proposed facility in accordance with all laws, regulations and the Solid Waste Management Plan. The proposed facility has proposed a proven technology (or innovative technology shown to be feasible) that is appropriate for managing the solid waste proposed to be accepted at the facility. List the name, address, telephone and fax numbers, and the role of all contact people related to the application, including, but not limited to, the applicant, its consultants, engineers, attorneys, etc. Specify who will be the main contact person during the application process. List the name, address and telephone and fax numbers of all persons owning five percent (5%) or more of corporate stock in the facility or a listing of the general and limited partners where applicable. In the case where no persons own five percent (5%) or more of corporate stock in the facility, the names of the corporate principals shall be listed. The SWAC, at its discretion, may request complete ownership disclosure by the applicant. List any intra-corporate relationships between the facility owner and any existing or previous solid waste hauling and/or management company. A copy of the deed of record establishing ownership of the facility property or, if the applicant is other than the landowner, a legal agreement (for example, a legal lease agreement) to use the real property in question for the intended purpose shall be provided. Operator - If the facility operator will be different from the owner, complete the following section. List the name, address and telephone and fax numbers of the operator of the proposed facility. If the operator is a corporation or partnership, the names and home addresses must be provided for all (a) stockholders who own five percent (5%) or more of its stock, or (b) partners who own a five percent (5%) or greater interest. The SWAC, at its discretion, may request complete ownership disclosure by the applicant. List any intra-corporate relationships between the facility operator and any existing or previous solid waste hauling and/or management company. State the type of facility being proposed, i.e. Class A recycling facility, Class B recycling facility, Class C recycling facility, transfer station, materials recovery facility, etc., and the corresponding N.J.A.C. citation of the definition of this type of facility. A separate SWAC facility inclusion application shall be filed for each type of facility proposed. Provide the name of the municipality the facility will be located in. Provide a tax map outlining the lot and block numbers of the facility site and of all adjacent properties. Detail the total acreage of all parcels comprising the proposed site. Indicate which parcels will be utilized for the proposed operation. State the street address of the proposed facility. Provide an original 7.5 minute USGS Quadrangle map which includes the boundary of the facility plotted on the map. The map shall delineate any public access roads to the site and any streams, ponds, wetlands, floodplain and sensitive receptors (e.g., hospitals, schools, playgrounds, churches, homes, etc.) within a one-half mile radius of the site. Describe the existing use of the property and how this existing use will relate to the proposed facility. Indicate the site access controls to be employed at the facility as well as interior traffic circulation. Include topographic contours and the flow of water (run-on and run-off) over the site. Include a vicinity map of a one-mile radius around the facility boundaries. Provide a description of the traffic impacts of the facility, setting forth the number and types of vehicles transporting material to and from the facility. Include the times and days of the week these vehicles will be accessing the facility. In addition, provide routes vehicle will be required to use to access the facility. Describe any restrictions on allowable transportation routes, if any. Finally, provide a description of nearby intersections that will be impacted from the development of the facility and their current status with respect to traffic levels. Provide a list of the material(s) to be accepted at the facility. Include the maximum daily tons accepted of each material. Indicate the types and quantities in percent and tons of any reasonably anticipated contaminants for each material accepted. Contaminants are materials that are extracted from recyclables for disposal. List any size, weight, or other restrictions regarding materials to be received. Describe the proposed process and technology to manage the materials accepted. Provide and describe reference facilities where this process and/or technology has been used successfully. Provide a written narrative waste flow of the facility from the receipt of each material to the point of transfer of end products. Describe the equipment utilized and techniques used to minimize all types of pollution. The name, address and telephone number of all planned end markets for the materials. List all end market contracts or agreements, and submit same as evidence of the applicant’s ability to sell the products resulting from the proposed activities at the facility. When end market contracts or agreements are not available at the time of application for a general approval to operate a recycling center, the applicant shall submit letters of interest from prospective end market users of the products resulting from the applicant’s recycling operation. Letters of interest may be based on information provided by the applicant to prospective end market users such as a description of the equipment to be used at the facility and the specifications of the products resulting from facility operation. If the applicant is proposing to use intermediate solid waste processing facilities prior to the delivery of materials to a recycling end market, then the applicant shall describe the facilities being used for each material. Descriptions shall include location, capacity and the operations and/or processes the intermediate facilities will perform on the materials. Identify the disposal facility(ies) that will manage residue from the proposed facility. Indicate the consistency of utilizing this disposal facility(ies) with the current Solid Waste Management Plan. List proposed means to control and/or limit access to the proposed facility, both during and after operating hours. List the hours and days of operation. Describe the inspection procedure for material delivered to the facility. State the procedure regarding when an inspection reveals that a load contains more than the allowable amounts of contaminants. Describe the record-keeping procedures for accepting material as well as transferring material off-site. The applicant shall record the municipality of origin of the material received; the name of the entity delivering materials to the facility; the vehicle license plate number, NJDEP registration number, if an NJDEP registered vehicle is used, and an EPA ID number, if an EPA registered vehicle is used. Floodplains - If there are any floodplains as defined at N.J.A.C. 7:13-1.2 within the facility, describe their location(s) and indicate what, if any, additional approvals will be required due to their presence along with any proposed actions to be taken by the applicant to avoid impacting them. Wetlands - If there are any wetlands within ½ mile of the facility, describe their location(s) and indicate what, if any, additional approvals will be required due to their presence along with any proposed actions to be taken by the applicant to avoid impacting them. Historic Sites - If there are any historic sites within the facility, describe their location(s) and indicate what, if any, additional approvals will be required due to their presence, along with any proposed actions to be taken by the applicant to avoid impacting them. Stormwater management plan for the facility must be provided. Potable Water – Describe the potable water sources within 500 feet of the facility. Describe the screening and landscaping provisions that may be incorporated at the site. Odors - Describe anticipated odors generated by the facility along with the methods used to minimize their impacts. Noise - Describe anticipated noise pollution generated by the facility and the methods used to minimize their impacts. Describe any and all discharges to the environment resulting from the operation of the proposed facility. This includes air and water discharges from either stormwater run-off and/or process water. In addition, describe any systems used to contain these discharges. List the significant benefits the facility will have on the community. List the significant negative impacts the facility will have on the community along with mitigating measures taken. Describe the need for the facility. Describe by percent the anticipated geographic points of generation, i.e., towns, county and/or state of each solid waste types accepted. Include the sector of the community, i.e., commercial, residential, industrial for each waste type and list any restrictions if any. Additional Pertinent Information: The applicant shall provide any additional information in the application that is pertinent to the proposal. In addition, the SWAC reserves the right to request any additional information. “I certify under penalty of law that I have personally examined and am familiar with the information submitted in this document and all attachments and that, based on my inquiry of those individuals immediately responsible for obtaining the information, I believe that the information is true, accurate, and complete. I am aware that submitting false information may be grounds for denial, revocation or termination of the approval." For a municipality, county, state, Federal or other public agency, by either a principal executive officer or ranking elected official. Provide a statement that the owner and operator agree to permit access by the MCMUA and other authorized county agents to inspect the proposed facility during operating hours, to ascertain compliance with applicable statutes, laws and regulations and the provisions of the Solid Waste Management Plan. Provide a statement that the owner and/or operator agrees to provide the MCMUA with all tonnage reports it is required to provide to NJDEP, at the times it is required to provide such reports to NJDEP. At a minimum, the facility shall provide monthly reports summarizing the types and quantities of solid waste received at and transferred from the proposed facility for each material from each municipality. By January 20 of each year, the facility shall provide the MCMUA with an annual summary of this tonnage information from the previous year. Provide a statement attesting to the fact that, subsequent to inclusion in the Solid Waste Management Plan, full copies of all NJDEP solid waste facility permit applications and/or modifications shall be provided to the Morris County solid waste coordinator within fifteen (15) days of submission to the NJDEP.